The winds are picking up now, but it’s nothing compared to what is going to be blowing in to Ocean City, NJ in 2016. An all new coaster designed by S&S Worldwide will blow into the amusement park, replacing two of their current coasters, and towering above all the other attractions. Are you ready to ride GaleForce? The all new coaster was announced for Playland’s Castaway Cove in Ocean City, New Jersey. The coaster will be an all new take on a familiar concept. It’s similar to the shuttle coasters that have popped up at Busch Gardens Williamsburg, and Six Flags Discovery Kingdom. It will launch riders forward, take let them fall backwards, launch them backwards, and then forward again 125 feet up, taking them over a beyond vertical drop, and through seven elements, including overbanked turns, inversions and drops before coming to rest back at the station. Unlike similar coasters that use two row seats, the trains on GaleForce will feature three rows, four across, and stadium style seating. That means that each seat will pretty much be independent of each other, and riders will get a great view, no matter where they sit. The coaster will replace two of the existing coasters, looping Python and Flitzer. The fate of those coasters aren’t known, but GaleForce isn’t the only coaster to go in that spot. 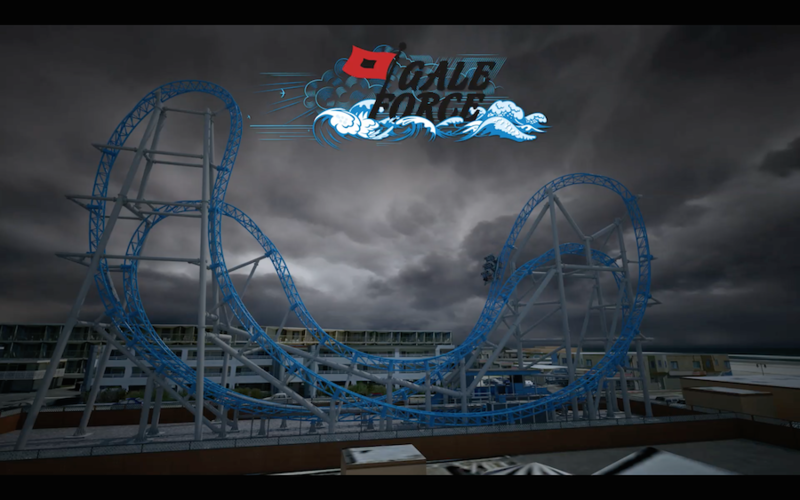 The owners aren’t ready to talk about the second coaster, but they did say it will wrap around GaleForce. We are definitely intrigued. Stay tuned for more coaster fun, and be sure to get social with us on Facebook, and follow along with us on Twitter @BehindThrills for the latest updates! For more information about Playland’s Castaway Cove, including tickets, visit the official website by clicking here!